I went to an all day Scrapbook Crop on Saturday. I decided on Friday night that I wanted to work on MY photos from my childhood. I ended up making a pit stop on the way to the event to buy some girly papers! This picture was taken at my 11th birthday party. I only have the one photo so I made it work. I purchased the title and the scalloped border from the Silhouette online store. The red and pink flowers are from Michaels and the white flower and paper are from Frosted Designs. This next one is a couple of photos of me playing outside. I used paper from Frosted Designs to show off my orange and blue outfits! I loved to roller skate - these were the metal skates that you fastened to your shoes!! I found a roller skate from the Silhouette online store. This next layout has paper that coordinates. I took one year of dance. This was my recital costume - are you kidding me a mouse????? No wonder I only danced for one year!!! When I was in kindergarten and first grade, I wore glasses. I had a lazy eye and had surgery when I was 4. One of my daycare girls wears glasses and I showed her this picture (which inspired me to scrap these photos at the crop)! Notice the couch in the background? It has orange in it. I went with orange and purple for my color scheme. I punched and cut out a variety of purple and orange butterflies. I added some 3 Girl Jam ribbon and a pair of glasses from the Silhouette online store. The next page is my 6th birthday. My mom made all of my birthday cakes when I was little. I purchased these shapes and the Birthday Girl from the Silhouette online store. I added a little cake to the bottom of the layout. 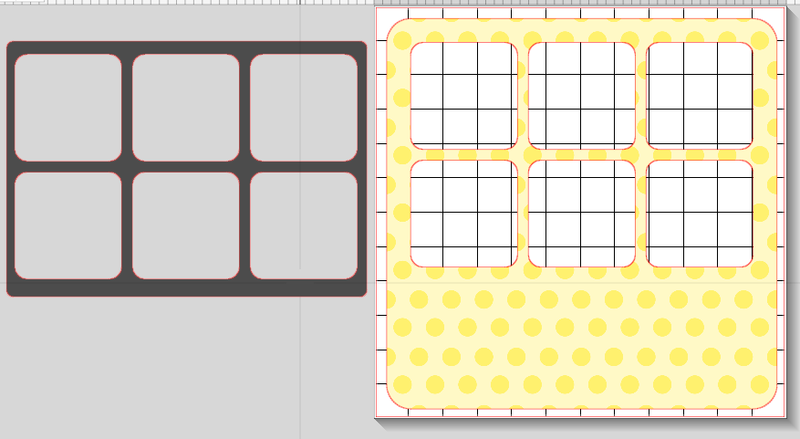 I have two more layouts that I started at the crop. I do not bring ribbon, gems, flowers and other embellishments to crops. I never know what I will use and I bring enough stuff already, so some of my layouts get finished at home!! I had a great time and met some new friends! Our last Christmas Day celebration is at my in-laws ~ Mimi and Papa! Tanner decided to wear his jammies all day! I cut the HoHoHo and trees from the Silhouette online store. I just love this Dec 25 cut and re-arranged my photos so I could use it! I turned this word 90 degrees to use as a title on the side of the page. These papers and ric rac ribbon came from the December kit at Frosted Designs. There may be some left!! Monday I shared my Christmas Eve-Eve layouts. If you missed them you can see them HERE. Christmas Eve we spent at the zoo this year. My layouts from yesterday are HERE. Christmas morning was a little different this year. Kramer, our oldest, works overnights right now and had to work Christmas Eve. He got home at 7:30 so we did NOT get up at the crack of dawn!!! We had to wake up Tanner, the youngest, for the first time ever on Christmas morning!! I used these trees from the Silhouette online store cut in gold metallic paper. I inked the edges with Vintage Photo ink. The title also came from the Silhouette online store and I created a shadow layer (with the offset feature). Tanner (on the left above) picked out this Green Bay Packers shirt for Kramer - these two are pretty tight! The Ho Ho Ho also came from the Silhouette online store. Tyler (on the left) hates when I take his photo - notice the scowl and absolutely no eye contact!!! Santa brought Tanner a new baseball glove! Now I just need to finish the Christmas Day at Mimi and Papa's house layouts!!! Yesterday I shared our Christmas Eve-Eve layouts HERE. We spent Christmas Eve at the Omaha Henry Doorly Zoo. My sister-in-law and niece met us there. The animals were very active and even though it was cold outside, it was so much fun! I used some page layout designs from the Silhouette online store that had cut outs for the photos. 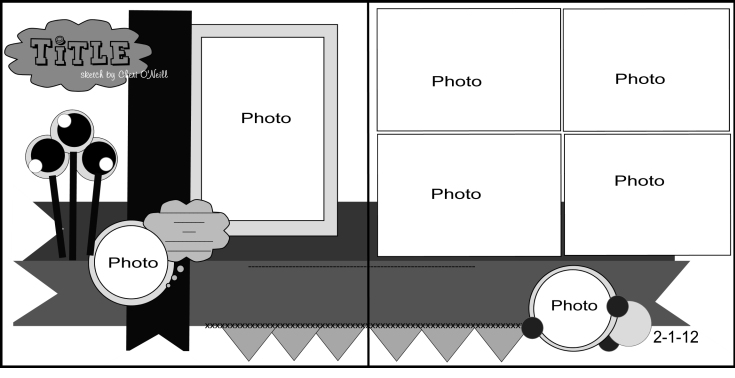 I thought the photos looked lost, so I created a frame by cuting out a rectangle around the cut out windows in black cardstock. I adhered the pieces on top - I think the photos look better with the black background! Here is a re-creation of my frame. I purchased this title from the Silhouette online store and added the Santa hats!! I cut this title out using a font on my computer. I used lime green and red to match the pictures. This layout was featured in a Penguin Blog Hop HERE. We got to the Aquarium just in time for lunch!! I love watching the penguins when people are with them! I used some Dylusions Ink to spritz my background paper. These papers are from Frosted Designs - I just love them!! The second half of the Aquarium is under water. We love going through the Shark Tank - we walk through a tunnel at the bottom of the tank. Of course I had to add a shark!!! Tomorrow I will have Christmas Morning layouts on my blog - hope you join us!! 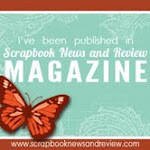 Today I am featured at Frosted Designs!! If you are looking for my Christmas Eve-Eve layouts, please go HERE. Hello!! Lori here with a summertime layout! I am a bit behind in my scrapbooking and take the off season (non-baseball season for 2 of my boys) to catch up! This is a picture of Tanner and some of the baseball team (plus a sister) swimming at a pool. We were out of town for our state tournament and only some of the team stayed in the hotel. The rest drove back and forth. The hotel did not have a pool, but the town did!!! The kids were catching some rays during the break and one of the moms got this shot! I love this arrow paper from the Hey Kid 12 x 12 paper pad because the arrows are pointing to the kids! I added a few details from the coordinating cardstock stickers. This layout was quick and fun - just like my son!!! 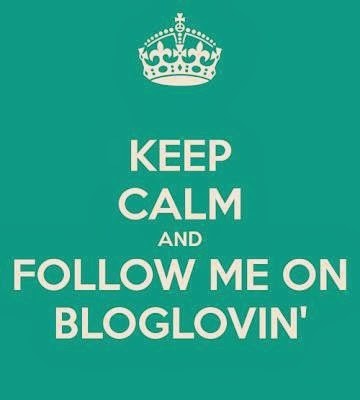 I have been neglecting my blog since Christmas. 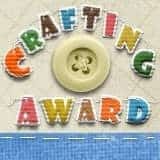 I have been crafting like crazy, but only posting my DT posts and Blog Hop posts. I hope to make up for it this week!! I completed our Christmas Eve Eve layouts from 2013. We typically spend Christmas Eve with my family (my step-mom, two brothers and their wives and children). Our tradition for the last several years has been to have soup and appetizers and a very casual laid back day. My older brother is a driver for UPS so when Christmas Eve falls on a week day, we have to wait a loooong time for him to get off work - and more importantly for the kids to open presents!! The past two years we got together the day before Christmas Eve. Hence the title Christmas Eve-Eve! I combined half of Merry Christmas purchased from the Silhouette online store and my own words from a font on my computer to create my title. I used the offset feature to create a shadow layer. I also cut some hanging ornaments out of gold metallic cardstock to add to my layout. I followed this sketch from Let's Scrap. The paper I used is from Frosted Designs December Kit (I purchased 2 so I had doubles of the papers). The left side is us opening presents, the right side is what happens every time the cousins get together!!!! I have three boys, my brothers have three girls between the two of them. I just love this saying - it is from the Silhouette store and was intended for a vinyl decor. It was not fun adhering it to the shadow I created (using the offset feature) but I really like how it turned out! Here you can see the joy!!! I hope you enjoyed our Christmas Eve-Eve!! Coming up tomorrow - Christmas Eve at the Zoo! For my project today, I purchased this snowman sign blank from Hobby Lobby before Christmas. The hat already had "Welcome" painted on it. It sat blank for a long time on my craft table. Finally I finished making all of the gifts for my friends and relatives, and I finished the orders I had for my wine glasses. I got out my white vinyl and cut out some snowflakes and my family name. I put three snowflakes by my name and had one left over. I almost put it next to "The" but at the last minute I changed my mind! I put it on the side of the snowman's hat. Now I have a sign for my front door to replace my Christmas wreath! Your next stop will be with Janet!